JayWalk - All Your Xmms Are Belong To Me: Referee Kayu!! 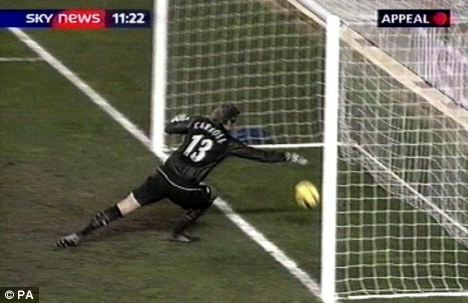 This was the controversial disallowed goal when ManUtd hosted Spurs recently (04 Jan 2005). It was a 60 yd punt trying to catch an off-positioned Roy Carroll. The goalie did get back in time but fumbled the catch as the ball bounced off his palms and over him into the net. The ball did actually land inside the goal by a yard but from where the linesman and referee were, it was disallowed. A great escape for ManUtd but I rather do without the 1 point as a result of the draw. It was clearly a Spurs victory.